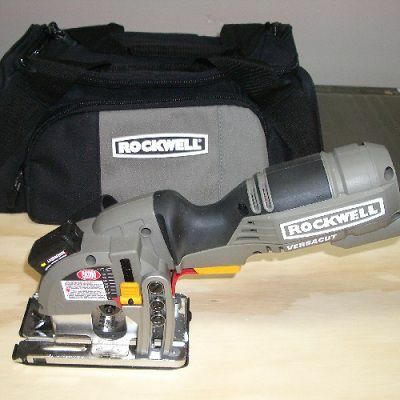 Rockwell Versacut Mini Circular Saw. (c) 2011 Chris Baylor licensed to About.com, Inc. The Versacut includes a parallel cutting-edge guide, a pair of wrenches for changing the blades, a non-scratch base cover (for protecting delicate surfaces such as vinyl-covered plywood), vacuum port, and a soft-sided carrying case. The Rockwell Versacut Mini Circular Saw is a unique cutting tool that could have some real benefits for small cutting tasks where a regular circular saw is simply too large. The 3-3/8 inch diameter blades are perfect for cutting thin veneers and other sheet materials such as plywood or particle board. The Versacut utilizes a spring-loaded base plate that doubles as a blade guard. The base plate is connected to the safety trigger switch, so after the trigger is depressed to start the motor, the user will push down on the base plate to expose the bottom edge of the blade before cutting the material as needed. When the cut is completed, the base plate extends downward to safely cover the blade and protect the operator. The adjustable depth gauge on the side of the saw can be adjusted to set the maximum amount of movement in the plate, determining the depth of cut. While this spring-loaded plate is a useful feature from a safety standpoint, in practical applications, it can make the saw a bit cumbersome to use. The amount of pressure needed to depress the plate isn't substantial, but because the motor of the saw is behind the blade rather than over the top of the blade, the center of gravity is well behind the blade. As a result, when cutting smaller or thin materials, pushing down on the saw to depress the base plate can prove difficult. I'm concerned that some users may try to alter the plate so that the blade is constantly exposed (to make it easier to access the blade), thus rendering the saw's major safety feature moot. The Versacut is equipped with a handy laser on top of the saw which projects a red line along the cut line. There is an on/off switch on the back of the laser to switch it on and off (rather than connected to the saw's trigger switch), and it is powered by separate batteries rather than from the AC power to the saw. While the laser works as expected, the user should remember to turn off the laser manually to prevent the batteries from going dead. Besides the unit's small size, the biggest advantage of the Rockwell Versacut would seem to be the saw's ability to cut a variety of materials. As far as a woodworking tool, the strength of the Versacut would appear to be in making small cuts in sheet goods, particularly when cutting small pockets or cutouts in the interior portions of the sheet of plywood or particle board. The saw will never be confused with a full-sized circular saw due to the short depth of cut. For small precision circular saw cuts, the Versacut is an interesting tool.